Boil the bulgur - according to instructions on the package, or just use twice as much water as bulgur, put in a pot with the bulgur, bring to a boil, put on a lid, turn down heat, and let stand for about fifteen minutes. Start by mixing the dressing - very easy, just stir it all together. Thin with some more water if you need to. Dice the halloumi cheese and fry it until golden and crispy. Let it drain on a piece of paper. Fry the leek and the crawfish tails briefly in butter, add salt and pepper. Peel and dice the orange, dice the avocado. And then the magic happens. Take a big bowl. 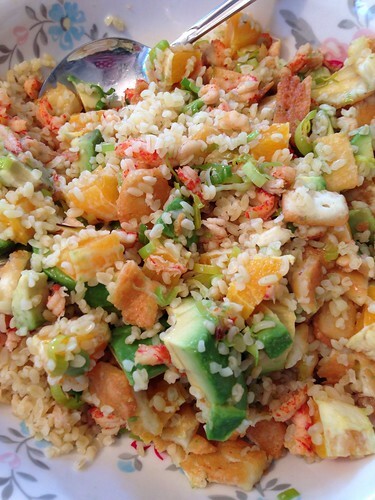 Add everything - the avocado and orange, the halloumi, the leeks and crawfish, the bulgur. That is it. Add the dressing. Enjoy.